The grocery business began as a complicated service industry. Random pricing, inconsistent quantities and prescriptive salesmen made grocery shopping burdensome. It took one brash Memphian with uncommon vision and unbridled ambition to change everything. 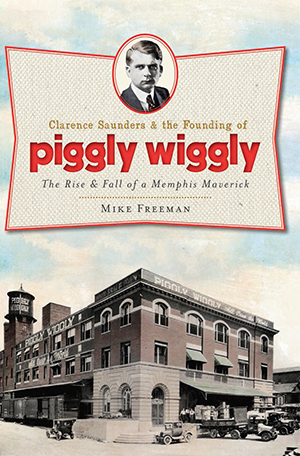 Clarence Saunders worked his way out of poverty and obscurity to found Piggly Wiggly in 1916. With an unprecedented approach, he virtually invented the concept of the modern self-service grocery store. Stores flourished, franchises spread and Saunders made millions. Yet just as the final bricks of Pink Palace—his garish marble mansion—were being laid, Saunders went bankrupt, and he was forced to sell Piggly Wiggly. A variety of new ventures helped Saunders out of bankruptcy, but he never duplicated his prior success. Memphis historian Mike Freeman tracks the remarkable life of this retail visionary. For over thirty years, Mike Freeman has made a career out of his love for Memphis and regional history. He co-wrote, with Cindy Hazen, two books about Elvis Presley—The Best of Elvis in 1992 and Memphis Elvis Style in 1997—and a book based upon Patsy Cline's letters, Love Always Patsy, Patsy Cline's Letters to a Friend, in 1999. For eight years he owned and lived in the first home Elvis purchased at 1034 Audubon Drive in Memphis. Mike has also written or co-written magazine articles about the area's fascinating personalities. In 2007, Mike helped create three DVDs: Elvis' Memphis and Beyond Elvis' Memphis with Artsmagic, Inc. (UK) and Elvis: Return to Tupelo with Michael Rose Productions. With his partner, Sue Mack, Mike continues to do research today and offers guided tours of the region. This biography of Clarence Saunders was actually his first project and his MA thesis. Until now, only excerpts of this work were published in the Tennessee Historical Quarterly (1992) and Tennessee Encyclopedia (1997).